When Is An Idle Wait Not An Idle Wait? In general, performance tuning is quite straightforward. You work out how much time is spent doing what, and follow the numbers to the things that are taking the most time. If you are fortunate to the have the Diagnostics Pack on Enterprise Edition of Oracle your Active Session History (ASH) will report the active database sessions. 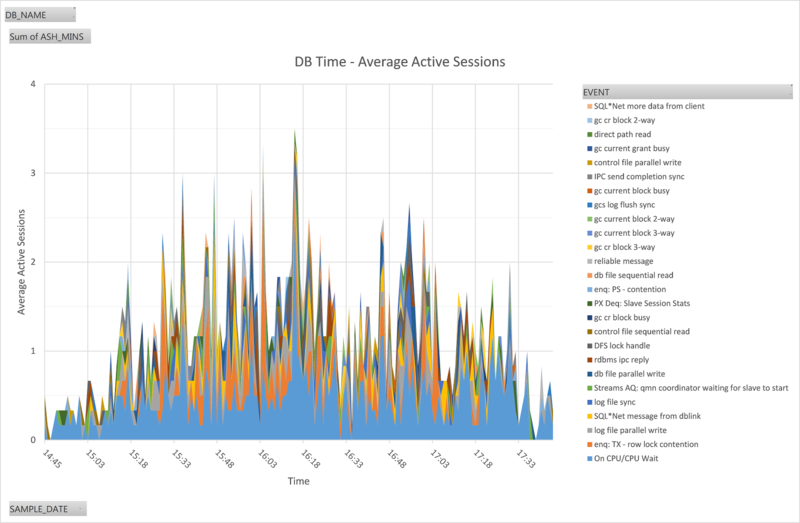 If you can measure the overall response time of a batch or application server you have merely to deduct the DB reported in ASH, and the difference is client/middleware time. While that is an over-simplification, it is substantially true. The rest of this blog is about an exception to the general rule. I've been working with a system that makes extensive, and probably excessive, use of database links. There is a constellation of 3 Oracle databases and there are database links between them. There is also a soon-to-be legacy DB2 database, and one of the Oracle databases uses Oracle Transparent Gateway to create Heterogeneous Database Links over which the application running on Oracle references data in the DB2 database. 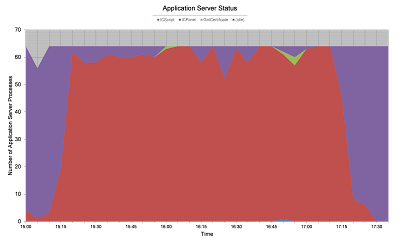 During a load test, nearly all of the 64 application server processes are reported as busy handling requests, yet ASH reports than usually less than 2 database sessions are concurrently busy. You would expect to see 60 application server processes consuming CPU, but CPU does not appear to be as highly utilised as we should expect. 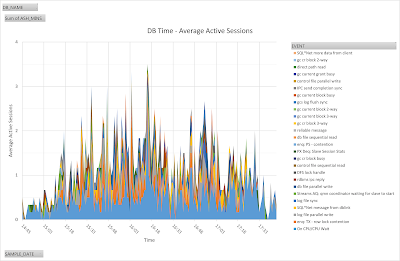 An application SQL trace reports that while the majority of the time is indeed spent on client CPU, about 20% is spent on a few SQL statements that reference synonyms that refer to tables or views in a DB2 database. Why didn't these show up in ASH? I wrote a simple test script that just executes the SQL statements that refer to the DB2 objects, but it collects AWR snapshots at the beginning and end of the script, and it also enables Oracle session trace. The first interesting output is that although some of the queries on DB2 objects took several seconds, I didn't get any rows in the query on ASH buffer for this session. So, now let's look at the trace file. 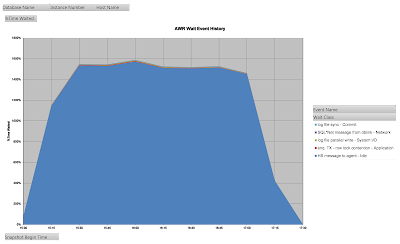 This is the output for the longest SQL statement having profiled it in TKPROF. We can see that nearly all the time is spent on an event called HS message to agent. And this is the corresponding section of the raw trace. The execution took just under 42ms, and then the fetch took 2.73 seconds. Across the whole of my test I have 29 waits on this event totalling 5.3s. Why I am not seeing this event in ASH? If I generate an ASH report on the two snapshots created in this test and look at the Foreground events I might start to see why. AWR reports 29 waits totalling 5 seconds, so that agrees. However, note that this is at the bottom of the report with 'SQL*Net message from client' and there is no '%DB Time'. We (should) know that 'SQL*Net message from client' is an idle event. 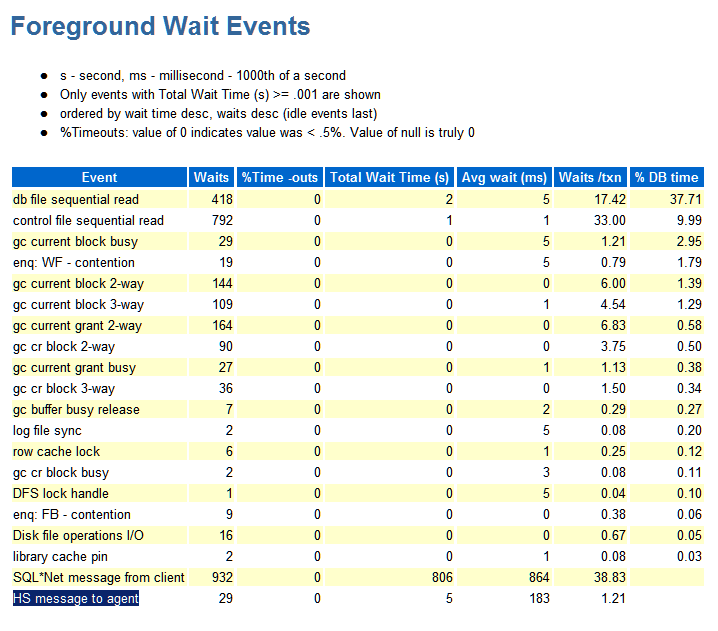 So we can understand that there are 806 seconds reported on this event in this AWR report because there were 151 sessions connect to the database, most of which were mostly idle for the 6 seconds between the AWR snapshots. That is perfectly normal. However, HS message to agent is classed as an idle wait, although the user was not idle. 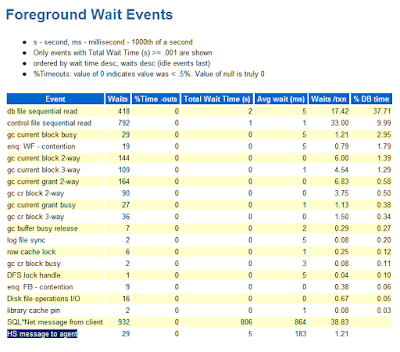 During this event the application is not busy, it is waiting for the Oracle database to respond, which is, in turn, waiting for the remote non-Oracle database to respond. This is in contrast to Oracle-to-Oracle (homogeneous) database links which report time to 'SQL*Net message from dblink' which is not an idle wait, but part of the 'Network' wait class. I think the difference is an anomaly. The next question is how much time my application spent on this event. For that I must look at the AWR data, either by generating an AWR report that corresponds to the load test, or directly in dba_hist_system_event. I am not the first person to call this out, just the latest person to get caught by it. It may be an idle wait, but the user is waiting for the database to respond. I got as far as starting to write an e-mail to a colleague asking for help, but before sending it I realised that I could do more to find out what was happening. Perhaps just the act of trying to explain the problem helped me to think more clearly about it.